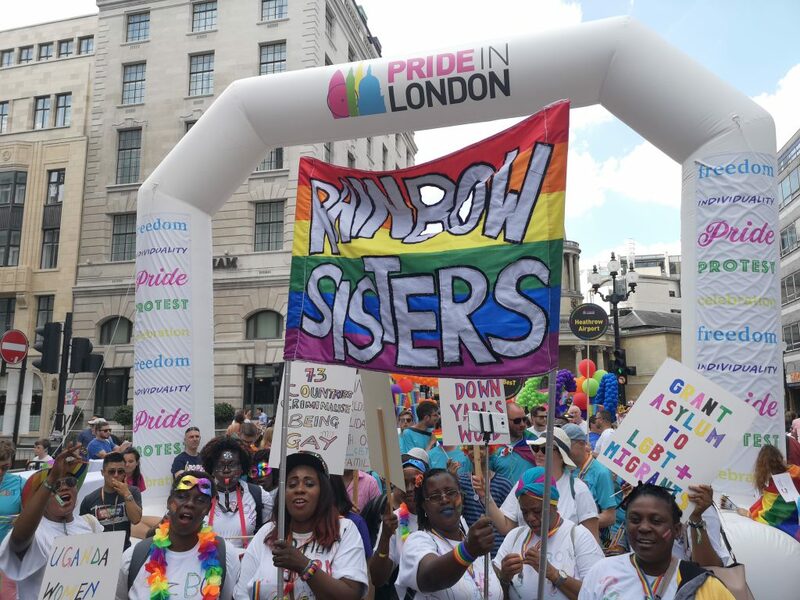 For several months, Rainbow Sisters, the group for lesbian and bisexual women at Women for Refugee Women have been preparing for London Pride. Not only were we to march at the Pride Parade, but we were to attend Black Pride, where we were speaking on the smaller stage. “Hurray, we are the Rainbow Sisters, from Women for Refugee Women. We do unite all lesbian and bisexual women, com’ from countries all over the world. We accept ourselves and each other, and celebrate who we are. And justice for a better living. Olatoyin, another of our members, is a brilliant drummer, and equipped with a small drum she helped us keep our rhythm as we practiced each week under Susana’s exacting tutorage. The day of the Pride Parade dawned, and with it came temperatures of over 90 degrees! Meeting outside Great Portland Street tube, we commandeered a bus stop shelter for shade and sang Happy Birthday to Tua, one of our most flamboyant members. We enjoyed birthday brownies and curious glances from bus passengers. Making our way to our area of ‘form up’ (this is the holding place where groups wait for the go-ahead to march) we were shocked to see that Serco, the security firm that runs Yarl’s Wood Immigration Detention Centre, where several of the women have been detained, were marching near us. It seemed a bitter irony. We know only too well how Yarl’s Wood traumatises women who have already had to flee persecution and violence. As we said to each other on the day, there is no pride in profiting from misery. Despite this duff note, the rest of the day went beautifully. Many of us felt overwhelmed by the support we were given by the spectators, who totaled around one million along the length of the route. We danced and sang along the route, the women stopping to be embraced across the barriers by well-wishers. Hands reached out and high-fived the women as they continued down the parade. By the end of the Parade, we were all overcome with emotion (as well as very hot and tired!). 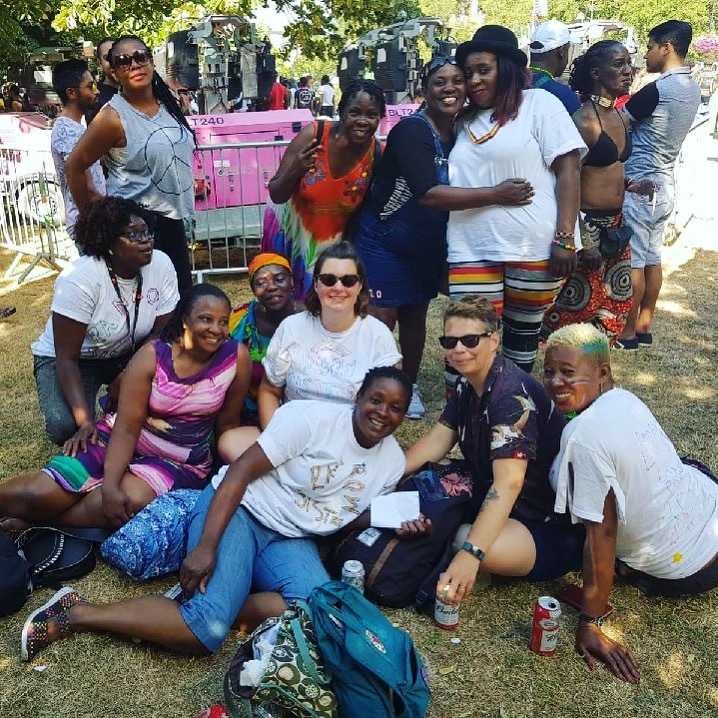 But the next day, we were out again for Black Pride in Vauxhall Pleasure Gardens. We met several groups who were holding stalls on the day, some of whom had seen us marching the day before. 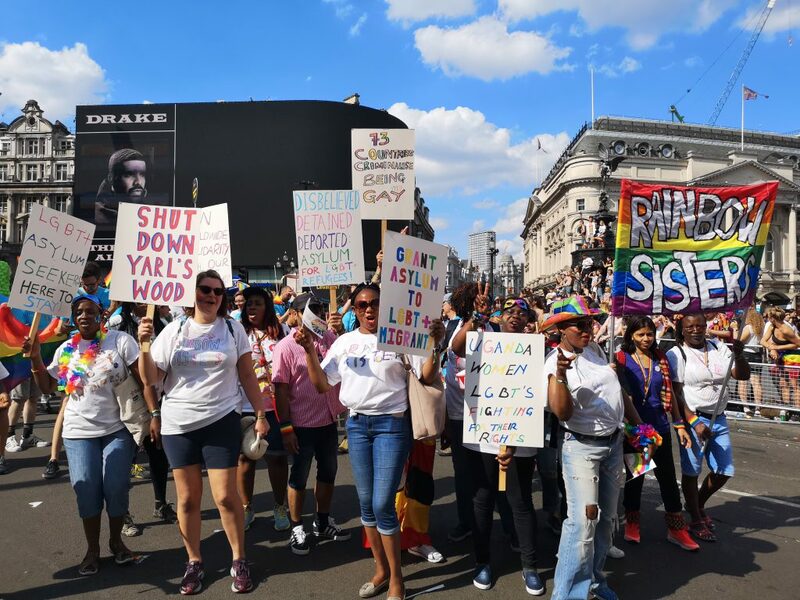 “Rainbow Sisters really stole the show!” said one man who had been marching in a group near ours. He wasn’t wrong! Rainbow Sisters had been allotted five minutes on the Wellbeing and Welfare stage. The women talked about the group, inviting other lesbian and bisexual asylum seeking women to join us in the future. Then we sang our song, which sounded excellent. We were given a really warm round of applause and then handed our leaflets out to the crowd. Then it was time for a well-earned drink in the shade and, for those with energy left, a dance. In short, it was a weekend none of us are likely to forget.